22-25 Jackson Ave. at 46th St. Ask any American child today to name his or her favorite woman director and you’ll probably be left with a long embarrassing silence. Okay then, let’s try again. Name one woman filmmaker, dead or living. Again, no response. It’s a troubling situation that the New York Filmmakers Cooperative has been trying to rectify for the last four decades. In the spirit of PS 1’s WACK! Art and the Feminist Revolution, young movie enthusiasts Maya and Noa Street-Sachs, daughters of two Brooklyn experimental filmmakers, have put together a splendid afternoon of films by seven of Americas’ most awe inspiring women directors. 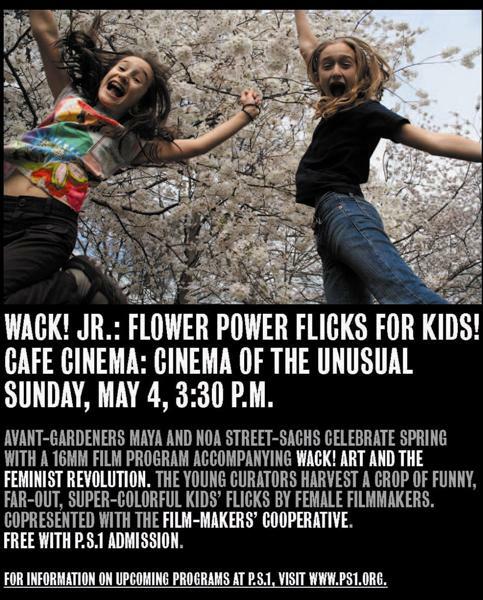 From an early garden dance tour-de-force by avant-garde film’s grand-dame Maya Deren to a 1968 political manifesto dressed in visual whimsy, these movies may not be very well known but they are sure to entertain any adventurous 1 to 100 year old child.